Bits or pieces? 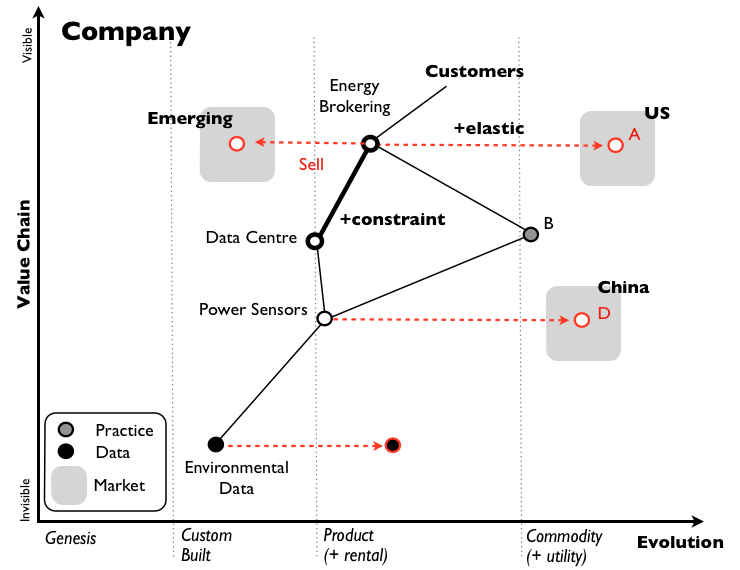 : Business Model Canvas ... the end of a long road. I'm currently hitting a road block with the latest memes around business model canvas and it's driving me nuts. First, let me be clear, I find business model canvas an extremely useful tool but it's not the beginning but the end of a long road. 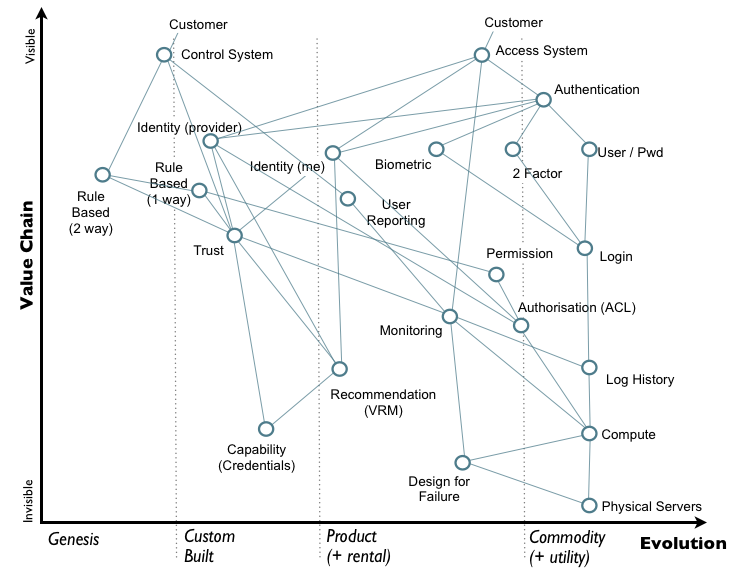 Whenever I look at doing something in business, the first thing I do is map out the landscape focusing on the user needs. 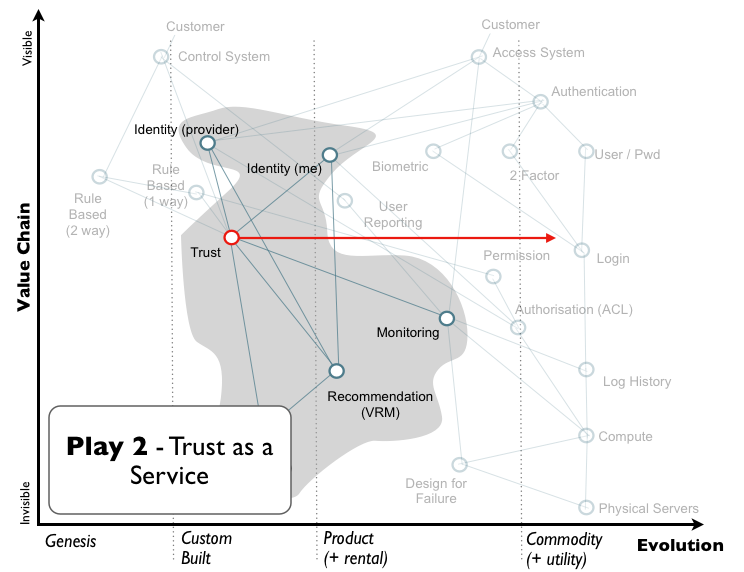 In figure 1, is an example map (an old early draft) from a section of the security industry. 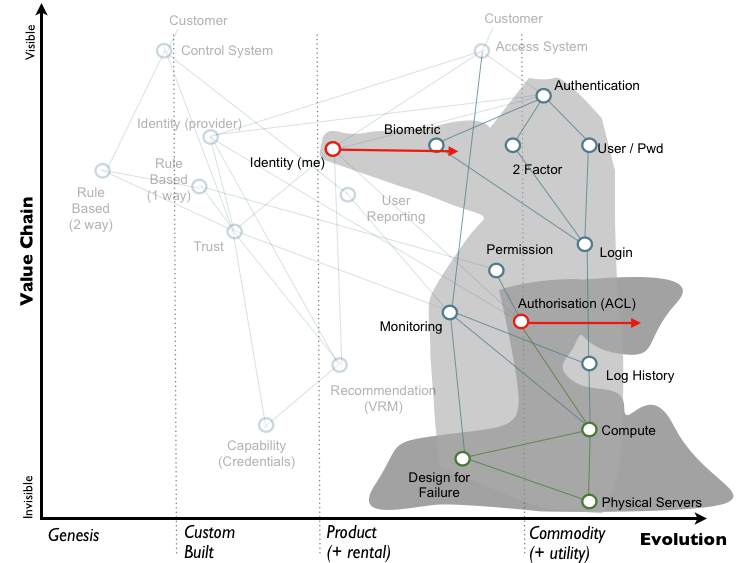 Figure 1 - Security Industry. The next thing I do is look at WHERE we can attack i.e. the various plays open to us. This usually is an intensive process of discussion. In figures 2 & 3 are two example plays from a dozen odd potential plays in the map in figure 1. 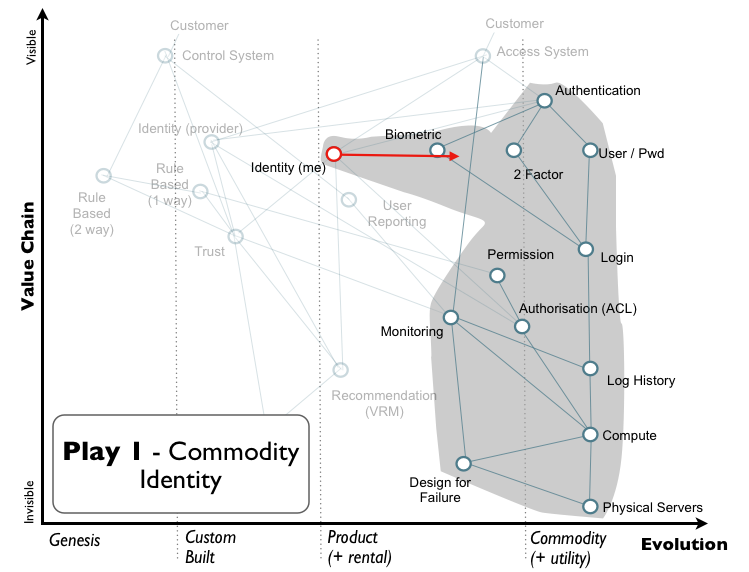 Figure 2 - Play 1 - a commodity play around Identity. The map usually provides immediate cues as to what is risky, what has potential now and what has potential for the future. I then normally look at what steps we can use to make the plays happen (see figure 4) looking for supporting and complimentary approaches. I then take these multiples WHEREs and examine the outside market, looking at competitors, inertia they have, inertia we have, what we can exploit, what capabilities are needed, where we can build ecosystems, what constraints exist, buyer / supplier strengths, likely economic effects - an example of a small part of very old map in a different field is provided in figure 5. I then normally pick a few of the most attractive WHERE's which we can influence highly (either through open approaches or use of dark arts) and have beneficial properties (constraints we can exploit, potential for ecosystems, poor strategic play by competitors) and run a few scenarios looking for how things are likely to evolve, potential for co-evolution, impacts of points of change, predictability of change, what's likely to emerge, what we should discontinue or sell elsewhere etc e.g. 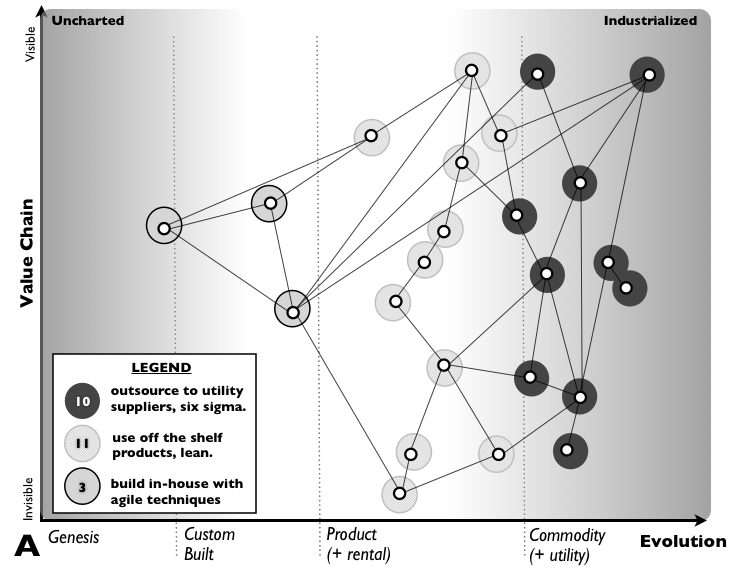 see figure 6 - from another industry. At this point, I normally have multiple WHERE's, the user needs, the potential impacts of changes, what we can influence, target markets and information on how to play the game. This can take a lot of effort, for a reasonable size business then you could be talking a few days work or even a week or so of hard graft. But at the end of this process then I'm at the point of saying WHY we should attack one space over another or WHY we should attack multiple points. I'll normally have a map and the background info to demonstrate this in a way that everyone in the organisation can understand, discuss and input into. It's at this point we can develop our chosen point of attack - I can usually state all the activities , practice and data involved, how we should attack, what the user need is (and what we emphasise on), what components we need, where the constraints are (and how we exploit), what markets to focus on, our revenue models, how we should manipulate (e.g. open approaches) and estimate the likely cost structures from the components. I have a good idea of how to play the game, cope with competitors, who we should acquire and what to watch for. I'll have a pretty decent idea on how to play the game to our advantage. At this point, I'll have ALL the information I need to fill out a business model canvas (see figure 8). 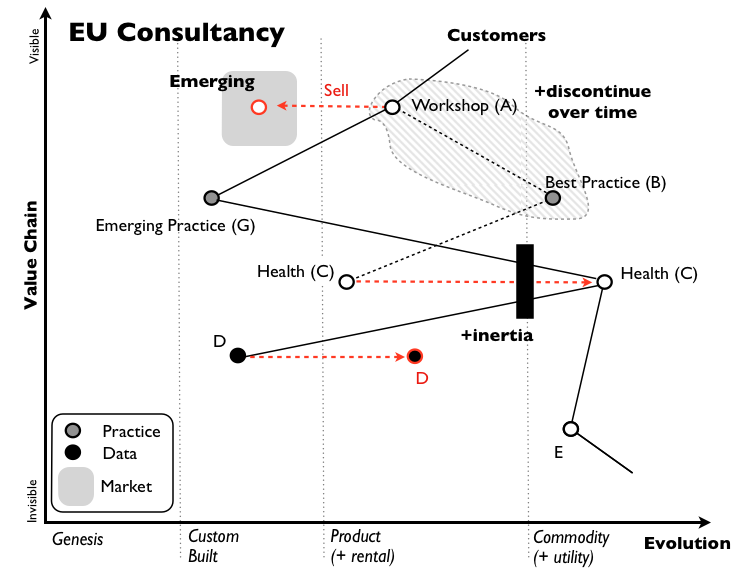 I prefer just to use the maps since the business model canvas is an artefact of the process. However, it's a neat summary of the bits of the map (or maps) that I want us to focus on and hence I do find it can help. The map however provides the greater context and situational awareness is key with strategic planning. Oh, and just for your info, mapping is the stuff I used when I was CEO of a Canon subsidiary and when I ran strategy for Canonical. I would never hand this off to some other company or agency. Mapping was important in understanding how to play the game which is what we would do next. Let me emphasise - WE played the game which meant WE had to understand the landscape that WE were competing in. 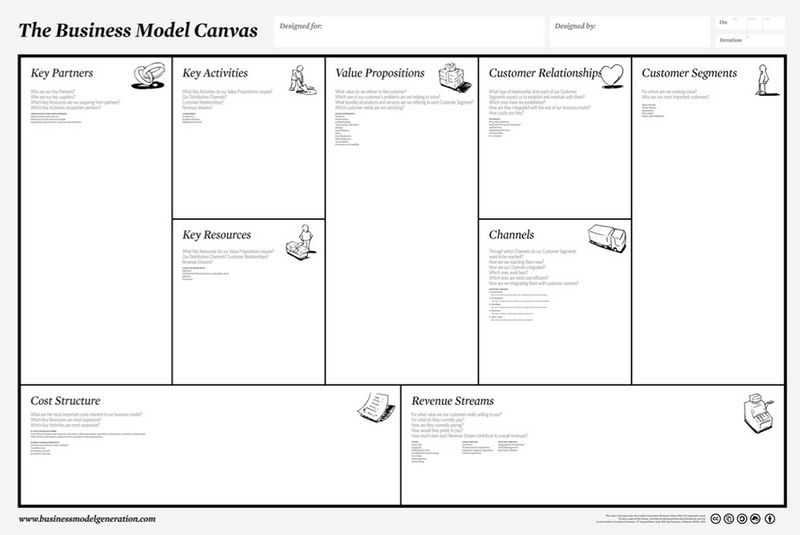 So, given I think Business Model Canvas is a useful technique then what's my problem with it? I'm starting to get companies asking me what do I think of their Business Model Canvas which is all good. BUT, I normally respond with "can I see your map or some other expression of situational awareness, the plays, comparison to market / competitors and your scenarios examined?" A disturbingly frequent response is "we don't have that but what do you think of our canvas?" Let me be clear to everyone. I think you're foolish to even consider committing one cent to an idea expressed on a business model canvas without any situational awareness of the competitive landscape or scenario planning. The business model canvas is not where you start, it's at the end of a long road which could take a week to travel. Ok, it's better than the even more crazy ideas of not even expressing what you're planning to do in a clear form but the canvas is all about the 'how, what and when'. You really do need to answer the 'where' and then 'why' before you start using it. The canvas is the end of a journey and not what you fill in at the beginning! Don't get me wrong. The business model canvas is an extremely useful tool BUT if you think that filling it out has anything to do with understanding strategic play then you are sorely misguided. Yes, you may well still be successful but you're not looking at the environment and that's a bad move on average as you're leaving more stuff to chance than necessary.